Human rights and market economy are two words normally not associated with each other, yet there is a strong connection. 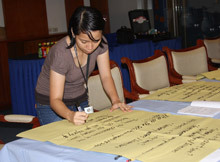 To discuss this, the Friedrich Naumann Foundation (FNF) conducted a half-day seminar for Ateneo Human Rights Center (AHRC) staff and interns on 14 May 2008 in Makati City. “This is the first time the Center looked at human rights from the perspective of economics,” said AHRC Executive Director Carlos Medina Jr. “This gave us a better perspective of things. For example it is assumed that government should provide basic services, but actually government should provide for the correct environment [for the market to supply these],” he said. FNF Resident Representative Siegfried Herzog started the seminar with a discussion on the basics of market economy. 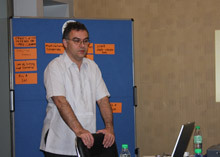 He explained how the free market can be understood as an instrument of decision-making. It is very good at directing goods and services to their optimum usage, creating win-win situations for producers and consumers. He also stressed the important role government has in providing a strong institutional framework for this to work well. This includes defining and protecting property rights and effective contract enforcement. In other words, strong and impartial rule of law is required, which is of course a key concern of human rights advocates. Government, however, often intervenes directly in the market mechanism through price control, subsidies, taxes, tariffs and monopolies. Reasons are either political or quick fix measures as the negative — and usually severe — effects of these distortions in the market will not be felt at once. Herzog argued that government would be more efficient in creating equal access to the market thereby helping the disadvantaged to compete on better terms. This is done through crafting and implementing laws against unfair competition and penalizing business externalities like environmental degradation. Participants then discussed these issues in groups. They specifically looked at: rice subsidies, minimum wage fixing, creation of monopolies and cartels and effects of taxes and tariffs. In each case, the challenge was to analyze the potential positive and negative effects both in the short and the long term. The last part of the seminar dealt with the economic reality facing the poor. Their economic progress is hampered by burdensome regulation that keeps their businesses in the informal sector. This puts them at the mercy of politicians and bureaucrats who will protect them for bribes or votes. The obstacles to growth remain formidable. Moreover, for a market to function property rights is needed. The act of buying and selling is really a transfer of property rights. Assets with clear property rights can become capital because the financial sector can then create credit using these as collaterals. Physical control of assets without the existence of transferable property rights by contrast does not allow the creation of credit and thus limits investment and growth. Thus, the greatest obstruction the poor have is they often do not have well-defined property rights even if they control assets like a slum hut. Giving the poor access to efficient property rights through land reform or making it easier for squatters to have land titles would allow them to invest in their property and to access credit more easily. Studies of the land reform program in the Philippines have indeed found this to be true. The real challenge therefore is to make the market work for the poor. That means bringing the benefits of a well-designed and impartially implemented rule of law to their daily lives. This task is one that advocates of human rights and alternative lawyering have been concerned with all along.